Stragglers recorded their first victory of the 2018 season, overcoming Northchurch at The Meadow by 118 runs in a sweltering forty over match. Losing the toss over a rock-hard pitch that had seen almost 600 runs scored the day before, Stragglers were sportingly inserted to bat. James Allsop made the most of the early scoring opportunities and raced to 41 from just 35 balls before chopping on. Matt Suckling fell victim to one of the few balls of the day to misbehave, swaying out of the line of a short pitched delivery, only to see it cannon into his stumps. This made way for Tony Hooper, self-effacing as he pulled on his gloves with claims that he’d be back shortly, though when he got off the mark with a smart boundary from only his second delivery, it seemed like he may have rediscovered form. Fifteen overs later, he had put on 90 with 15-year-old Joel James, borrowed from Northchurch and enjoying his first taste of wandering cricket. When Hooper got into the 90s himself, the captain was heard to comment that he must surely be nailed on for a hundred… He was bowled next ball for a pleasing-to-the-eye 90 from 63 deliveries and what a delight it was to see Tony returning to the pavilion beaming from ear to ear. Other notable contributions to a final score of 256 came from Tom Calder’s fluent 25 and guest James Burke’s brutal cameo of 24 from ten balls. Northchurch got off to a slow start in response and were never able to exert any notable pressure over the Stragglers’ bowling attack. Hunt and Vila did the damage up top by reducing the home side to 45 for four, the captain enjoying the pace of the pitch to blow away his men, while the more refined Hunt went for the attritional approach. 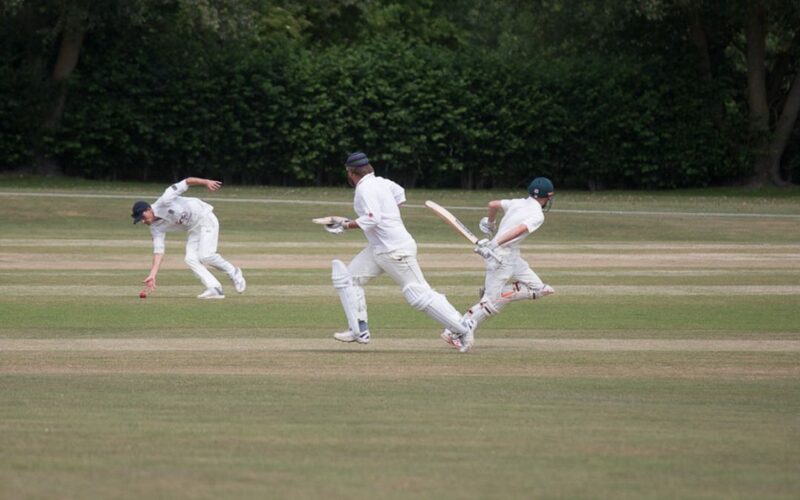 Northchurch somewhat rallied against the change bowlers, compiling two consecutive fifty partnerships, but Stragglers’ tight bowling ensured that no one would go on to make the big score necessary to threaten their total. From 135 for five, the home team collapsed to 138 all out in 41 overs. As the Stragglers’ supped cold beer and watched the sun heading for the horizon, it was noted what decent hosts Northchurch had been and it was agreed that it had been a good day indeed.